Epping is a suburb 18 km north of central Melbourne, on the Darebin Creek. Until 2012 it was the terminus of a metropolitan railway line. The original Epping township is on higher ground west of the Darebin Creek (the Catholic church being the only one not to have moved from lower flood-risk land). Several older buildings are constructed in bluestone, plentiful in the surrounding volcanic plains. The Whittlesea shire/city offices were at Epping until about 1993. On Epping Road there is a strip shopping centre, and the drive-in Epping Plaza shopping centre (1996) to the west. The Epping hospital (1998) adjoins it. Along the Darebin Creek there is a linear park, and there are several neighbourhood reserves. 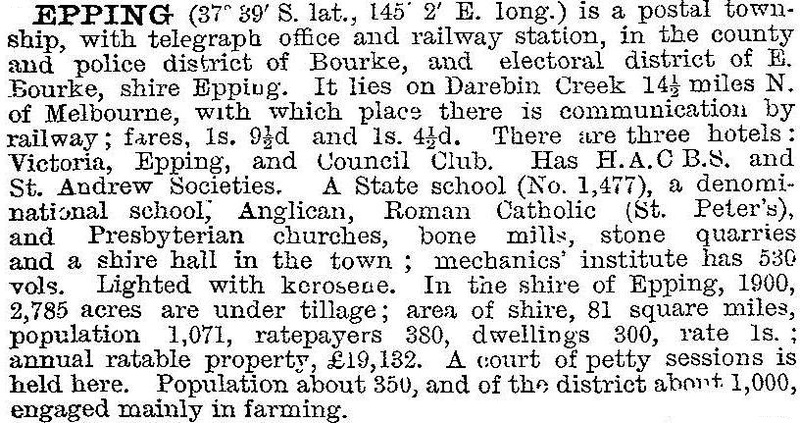 In 1992 the Epping Returned Soldiers’ League moved to Harvest Home Road, Epping North, in the midst of open country. Vic Urban bought up vast acreages in Epping North and in 2006 launched Aurora estate, projected to house 25,000 people by 2025. Between the Aurora estate and Epping Road there is A.V. Jennings’ Lyndarum estate with a shopping centre and Epping Views State primary school (2008). There has been a comprehensive study of native flora and fauna on the Aurora site. Mature red gums will be conserved and plans made for conservation of grasslands and rare fauna such as the growling frog. Some former farmlands are overburdened with exotic plants and weeds. Epping North’s farm heritage is best seen along Harvest Home Road. Two town centres and State and Catholic schools reserved sites reserved in 2012 in Epping North and in 2014 that area was identifed as a growth suburb and site for a new primary school. A somewhat controversial decision was made to relocate Melbourne's Wholesale Fruit, Vegetable and Flower market to a new site in Cooper Street, Epping, in 2014-15.